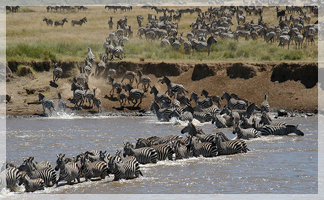 Arguably the jewel of Kenya's Wildlife Sanctuaries, Masai Mara hosts the annual wildebeeste(gnu) and zebra migration of over 2 million animals between Kenya and Tanzania during the months of June-October.The 3-day Masai Mara Safari Tour is about having a close encounter with the wildlife population of the region. 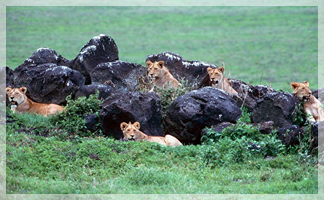 You can easily spot Lion, Cheetah, Elephant, Buffalo and several other jungle beasts on your safari trail. Full day spent exploring the park in search of the Big 5. Optional hot air Balloon safari can be arranged at an extra cost of US$ 450 per person. 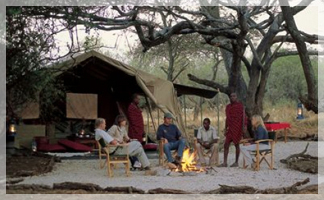 Dinner and overnight at Mara Sopa Lodge or similar. Depart Nairobi at 0800 hrs and travel to the Amboseli National reserve at the foot of snowcapped Mt. Kilimanjaro, Africa’s highest peak. Arrive in time for lunch. Afternoon game drive is taken. Dinner and overnight at Amboseli sopa lodge or similar. A full day in this photogenic park. Morning and afternoon game drives. Meals and overnight at Amboseli Sopa lodge or simlar. Amboseli National park is one of the most popular wildlife sanctuaries in Kenya. It is situated close to Kenya. It is situated close to Kenya- Tanzania border, The Park lies at the foot of Mt. Kilimanjaro, the highest mountain in Africa (5,896m) whose snow-capped summit presents a splendid view on clear days. Amboseli National Park is often referred to as “The home of Elephants’ some of the largest Elephant herds are found here. The Game Park also contains vast groups of Zebras, Wildebeests, Giraffes, Buffalos, Hippos and Antelopes. Also to be found in Amboseli are lions, leopards, Cheetahs, Rhinos and many species of plain game. Pre-breakfast game drive, afternoon depart for Nairobi arriving in the afternoon. We depart Nairobi in the morning and drive south through Maasai country to the plains below Mt. Kilimanjaro where Amboseli is situated. After a stopover lunch at the lodge we proceed into the scenic Amboseli National Park for a game drive returning to Amboseli Serena the lodge in the evening for a sun downer. Despite its small size (392 sq km), this fragile ecosystem supports a wide range of mammals (well over 50 of the larger species) and birds (over 400 species). The waters from Mt. Kilimanjaro drain down the mountain under lava flows and surface in Amboseli, creating a green belt of swampland amidst dusty plains. Amboseli lacks the profusion of animal species found in the Mara, but the landscape provides limited cover so we have better chances of seeing some of the larger predators. Elephant, buffaloes, lions, gazelles, cheetahs, wildebeest, hyenas, jackals, warthogs, Masai Giraffes, zebra, baboon, and waterbuck are all present in the park. We drive early to Tsavo West National Park and a stop-over is made at Mzima Springs, the source of most of Mombasa’s fresh water; you can walk down to an underwater observation chamber where it is literally possible to watch hippo or crocodile swim along the floor of this crystal clear spring. Tsavo is particularly famous for its large herds of elephants. Back at the lodge we enjoy a sun downer, dinner and a good night’s sleep. An early morning game drive permits further exploration of this great park followed by breakfast. We then depart for Nairobi arriving in the afternoon. Pick up from your hotel at 0730 hrs and drive to the Great Rift Valley viewing sceneries enroute.We arrive to the Pink Lake often referred so due to it’s Great masses of Flamingos in good time for lunch. Lunch at a lodge followed by full afternoon game drives. Dinner and overnight at Lake Nakuru lodge or Flamingo Hill tented lodge .Lake Nakuru's claim to fame is anchored on its flamingo's and the over 400 species of birds found here. The lake itself is a soda lake on the floor of the rift valley. The sight of the at times millions of flamingos is quite spectacular. From a distance the lake appears ringed in pink. The Lake has also earned a reputation as an important haven for endangered species- particularly the Rothschild Giraffe and the black and white rhino. Lions, waterbuck, buffalo and baboons are all residents here. We break the camp/depart the lodge soon after breakfast and proceed to Maasai Mara to arrive in good time for Lunch. Late afternoon game drives followed by dinner and overnight stay at Mara leisure lodge or Keekorok lodge. Full day spent exploring the park in search of the big 5 - Optional balloon safari can be arranged at an extra cost of US$ 450 per person. 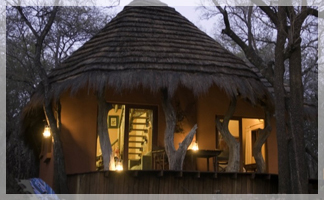 Dinner and overnight stay at Mara Leisure Lodge or Keekorok lodge. The Mara offers wildlife in such variety and abundance that it is difficult to believe: over 450 species of animals have been recorded here. You will easily see lions, rhinos, hippos, crocodiles, giraffe, wildebeests, zebras, buffalo, warthogs, hyenas, jackals, wild dogs, buffalo, leopard, many kinds of antelopes and elephant. It is in the Mara that perhaps the most spectacular event of the natural world takes place. This is the annual migration of millions of wildebeest and zebra from the Serengeti (Tanzania) in search of water and pasture. Following on their heels are the predators of the savanna- lion, cheetah, wild dog, jackal, hyena and vultures. Pre breakfast game drives then drive to Nairobi via Narok to arriving in the afternoon where the tour ends. Depart for Masai Mara, drive through the lush Kikuyu farm land to the edge of the Great Rift Valley. Descend the escarpment via the Loita Plains to Masai Mara Game Reserve in time for lunch. Evening game viewing, dinner and overnight at the Mara Simba lodge. Full day spent viewing and exploring this spectacular park renowned for its large numbers of game such as wildebeests, zebras and its majestic predators. Dinner and overnight at the Mara Simba lodge. After breakfast, proceed to Naivasha arriving in time for lunch. Get a chance to see Lake Naivasha, the second biggest fresh water lake in the Rift Valley. Lake Naivasha is an ornithologist’s paradise. Dinner and overnight at the Lake Naivasha Sopa Lodge. After breakfast, proceed to Lake Nakuru arriving in time for lunch. Evening game drive with dinner and overnight at the Lake Nakuru Lodge. Pre-breakfast game drive. After breakfast, depart for Nairobi. 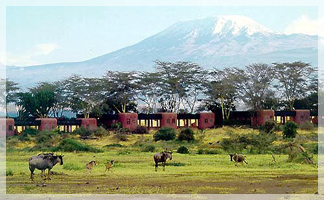 Depart Nairobi in the morning for Amboseli National park at the foot of the snow capped Mt. Kilimanjaro, Africa’s highest mountain. Lunch at a lodge. Afternoon game drive. Dinner and overnight at Amboseli Serena lodge or Oltukai lodge or similar. A full day in this photogenic park. Morning and afternoon game drives. Meals and overnight at Amboseli Serena Lodge or oltukai lodge. After breakfast departs for Maasai Mara - the land of vast migrating animals. Arrival will be in time for lunch. After lunch embark on a game drive. Dinner and overnight at sopa or Sentrim Lodge. Full spent exploring Masai Mara in search of the Big 5. Morning and afternoon game drives are offered. Optional hot air balloon safari can be arranged at an extra cost of US$ 450 per person .Dinner and overnight stay at Mara Sopa or Sentrim Lodge. The Mara offers wildlife in such variety and abundance that it is difficult to believe: over 450 species of animals have been recorded here. You will easily see lions, rhinos, hippos, crocodiles, giraffe, wildebeests, zebras, buffalo, warthogs, hyenas, jackals, wild dogs, buffalo, leopard, many kinds of antelopes and elephant. It is in the Mara that perhaps the most spectacular event of the natural world takes place. This is the annual migration of millions of wildebeest and zebra from the Serengeti (Tanzania) in search of water and pasture. Following on their heels are the predators of the savanna- lion, cheetah, wild dog, jackal, hyena and vultures..
A safari that combines bird watching at the Rift Valley lakes and wildlife safari in Maasai Mara and at the Aberdares, Lake Nakuru, Amboseli Lodge Safari cycling at the Hells Gate. 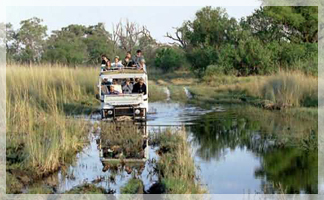 This is a special safari with minimal driving distances hence its ideal for families or senior citizens. Pick up from your hotel at 0800 hrs – Passing through the industrial town of Thika and the intensely cultivated farms of the central Kenya. Lunch at the Out span hotel Nyeri before transferring to the Treetops hotel. Dinner and overnight stay at the Treetops hotel The Aberdares ranges lie at an altitude of 2,134 to 4,268 meters. 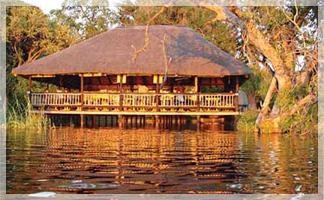 It is home to the first tree hotel in Africa and harbors significant memories in world history. In 1952, Queen Elizabeth II learnt of her accession to the British throne while she was a guest at Treetops lodge following the death of her father, King George II. Depart the lodge soon after breakfast and drive to Lake Nakuru National park. Lunch at a lodge followed by a full afternoon game drives at the Kenya's Park famed by its numerous species of birdlife. Dinner and overnight stay at Lake Nakuru Lodge or Flamimgo Hill Luxury Tented camp. Breakfast at leisure before driving to Lake Naivasha. A visit to the hells gate national park this park can be explored on foot or you could also cycle around the park Optional boat ride to Crescent Island can be arranged .Dinner and overnight at Naivasha Sopa Lodge. Drive to via the Great Rift Valley to arrive at Maasai Mara in time for lunch at Keekorok Lodge. Full afternoon game drive till dusk. Full day spent exploring the park in search of the big 5- Optional balloon safari can be arranged at an extra cost of US$ 450 per person The Mara offers wildlife in such variety and abundance that it is difficult to believe: over 450 species of animals have been recorded here. You will easily see lions, rhinos, hippos, crocodiles, giraffe, wildebeests, zebras, buffalo, warthogs, hyenas, jackals, wild dogs, buffalo, leopard, many kinds of antelopes and elephant. It is in the Mara that perhaps the most spectacular event of the natural world takes place. This is the annual migration of millions of wildebeest and zebra from the Serengeti (Tanzania) in search of water and pasture. Following on their heels are the predators of the savanna- lion, cheetah, wild dog, jackal, hyena and vultures. Game drives then return to the lodge for breakfast before returning to Nairobi where the safari ends This is a private tour. Maximum 4 pax. Pick up from your hotel at 0730 hrs. and depart for the dramatic semi-arid scrub land of the Northern Frontier. Arrival in Samburu will be by lunch time. After lunch embark on a game drive to sight resident wildlife species like the Reticulated Giraffe, Grevy's Zebra, Beisa Oryx and the Blue-necked Somali Ostrich that are rare elsewhere in the country. Dinner and overnight will be at the spectacular Samburu Ashnil Lodge or samburu lodge. Full Day spent exploring the park. Dinner and overnight stay at Samburu Ashnil Lodge or samburu lodge. After breakfast depart for Lake Nakuru. Arrival will be in time for lunch at your lodge, located inside the Lake Nakuru National Park. In the afternoon you will embark on a game drive where you will have the opportunity to spot leopards, rhino and the famous pink flamingos as well as a variety of other wildlife. Dinner and overnight at Lake Nakuru Lodge or Flamingo hill Tented lodge. Lake Nakuru's claim to fame is anchored on its flamingo's and the over 400 species of birds found here. The lake itself is a soda lake on the floor of the rift valley. The sight of the at times millions of flamingos is quite spectacular. From a distance the lake appears ringed in pink. The Lake has also earned a reputation as an important haven for endangered species- particularly the Rothschild Giraffe and the black and white rhino. Lions, waterbuck, buffalo and baboons are all residents here..
After breakfast departs for Maasai Mara - the land of vast migrating animals. Arrival will be in time for lunch. After lunch embark on a game drive. Dinner and overnight at Mara Sopa Lodge / Sentrim lodge. Full day in Masai Mara with early morning and evening game drive. you will explore one of the most famous and beautiful National Parks in the world, you will have the opportunity to spot the Big Five with their associated predators which include the Buffalo, Rhino, Hippopotamus, Oribi, Warthogs, Thompson's Gazelles, Zebra, Hartebeest among many others. 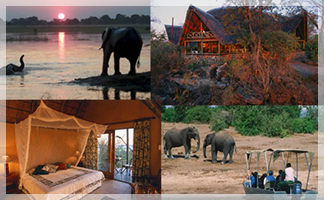 All meals and overnight at Mara Sopa Lodge / sentrim lodge. After a leisurely breakfast, return to Nairobi where the safari ends. This is a private tour. Maximum 4 pax. Pick up from your hotel at 0730 hrs. and depart for the dramatic semi-arid scrub land of the Northern Frontier. Arrival in Samburu will be by lunch time. After lunch embark on a game drive to sight resident wildlife species like the Reticulated Giraffe, Grevy's Zebra, Beisa Oryx and the Blue-necked Somali Ostrich that are rare elsewhere in the country. Dinner and overnight will be at the spectacular Samburu lodge or Samburu Sopa Lodge. Today you will spend the full day in the Samburu National Park. You will have early morning and evening game drives. All your meals and overnight will be at your Samburu Lodge or Samburu Sopa Lodge. Break fast then view game as we exit the park and drive to Mount Kenya Region. Lunch at a Sweetwater’s tented camp then proceed for afternoon game drives at Sweetwater’s sanctuary. Dinner and overnight at the Sweet waters Tented camp Sweetwater’s is the o¬nly sanctuary for rehabilitation in Kenya of these widely abused chimpanzees with two groups living in an environment as close to their natural habitat as possible. The site is also a dedicated black rhino breeding area. Breakfast then depart the lodge for Lake Nakuru National park arriving in good time for lunch at Lake Nakuru Lodge or Sarova Lion Hill. 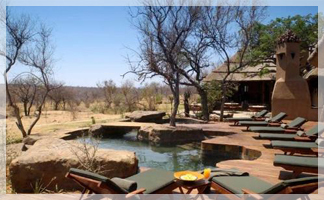 Full afternoon game drives followed by dinner and overnight stay at a lodge inside the park. Lake Nakuru's claim to fame is anchored on its flamingo's and the over 400 species of birds found here. The lake itself is a soda lake on the floor of the rift valley. The sight of the at times millions of flamingos is quite spectacular. From a distance the lake appears ringed in pink. The Lake has also earned a reputation as an important haven for endangered species- particularly the. Drive to via the Great Rift Valley to arrive at Maasai Mara in time for lunch at a Lodge. Full afternoon game drive till dusk before returning to Masai Mara Sopa Lodge or Serntrim lodge for dinner and overnight stay. Full day spent exploring the park in search of the big 5- Optional balloon safari can be arranged at an extra cost of US$ 450 per person. Early morning game drives then return to the lodge for breakfast at leisure drive to Nairobi to arrive by 1400 hrs where the safari ends This is a private tour. Maximum 4 pax. Lake Bogoria lodge safaris, Masai Mara Lake baringo lodge safari, masai mara lodge safari wildlife migration, samburu lodge safaris, Lake baringo safari, Lake bogoria safaris. A Grand tour that takes you Kenya’s fertile central highlands, to the barren northern frontier of Samburu, to the world famous Bird Sanctuaries of the Great Rift Valley Lakes Baringo, Bogoria and Nakuru, then South over the Mau Escarpment to Kenya’s greatest concentration of game - the Masai Mara. Kenya’s rift valley escarpments offer some of the most breath taking sceneries. We depart Nairobi in the morning and drive south through Masai country to the plains below Mt. Kilimanjaro where Amboseli is situated. After a stopover lunch at the lodge we proceed into the scenic Amboseli National Park for a game drive returning to the lodge in the evening for a sun downer. The waters from melted snow drain down Mt. Kilimanjaro under lava flows and surface in Amboseli, creating a green belt of swampland amidst dusty plains. Here buffaloes, lions, gazelles, cheetahs, wildebeest, hyenas, jackals, warthogs, Masai Giraffes, zebra, baboon, hippos and waterbuck can be seen against the backdrop of the magnificent snow-capped mountain. After a leisurely breakfast, we explore the park through morning and afternoon game drives. We have sufficient time for relaxation at the lodge, complete with the majestic Mt. Kilimanjaro in the background. Dinner and overnight at Amboseli Serena lodge. We leave Amboseli, viewing game as we drive via Nairobi to the Aberdares to enjoy the experience of staying in a Tree Hotel or lodge overlooking floodlit waterholes where wildlife and birds regularly visit. Dinner and a well deserved sleep thereafter. Over 40 species of wildlife inhabit the Aberdare mountain ranges, hiding in the heavily forested slopes and in the upper moor lands. The Aberdares is noted as a rhino sanctuary but keep an eye out for the elusive rare bongo, which is best, spotted in the upper bamboo zone and hypericum scrub. After breakfast we proceed further north across the Equator to the edge of the Northern Frontier. Arrival will be in time for lunch and an afternoon game drive returning in time for a sun downer and dinner at the Samburu Sopa lodge or Samburu lodge. Samburu is part of a lava plain that includes a diverse landscape of thorn scrub, red dirt, dried river beds, broken volcanic rock, steep hills, and rocky outcroppings. This reserve is becoming one of Kenya's most admired stops after the Mara. Sights of the peculiarly branched doum palms and thorn trees give an unusual look to the region. The whole day will be spent relaxing and leisurely exploring the Samburu National Reserve through morning and afternoon game drives. 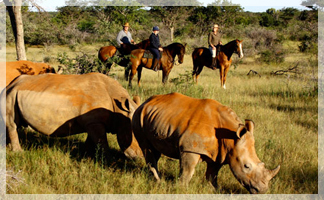 You may opt to do some of the activities offered at the lodges for a small extra cost. The light and vast openness creates a lonesome panoramic beauty and the permanent water supply acts like a lure for the abundant species found here. The region is home to the uncommon Grevy’s zebra with huge fury ears, gerenuk antelope standing on hind legs to feed, Somali ostriches with distinct blue legs and the shy Oryx. Elephant and crocodile are guaranteed sightings, excellent bird watching with numerous varieties of weaverbirds and the martial eagle. Leopard sighting is also a special feature here. We enjoy a final early morning game drive in the Samburu reserve then depart for the Mt. Kenya region. Arrival at the lodge in time for you to enjoy the facilities of the lodge, explore the Mount Kenya National Park or take an optional tour to the nearby Sweetwater's Reserve which is home to Chimpanzees. Mount Kenya was shaped by volcanic action linked with the creation of the Rift Valley and is thought to be older than Mount Kilimanjaro; geologists believe it previously stretched at least 1500m above its present height of 5199m (17,057ft). The Kikuyu people settled in the central highlands some 300 years ago called the mountain “Ngai” (God) who they believed lived on the top of Mount Kenya. Morning drive via the Nyahururu Falls down to the shallow soda Lake Bogoria and later to the beautiful lake Baringo where you may enjoy the pleasure of an evening bird walk. Dinner and overnight at the lodge. The Nyahururu Falls also known as Thomson Falls was named after Joseph Thomson who walked from Mombasa to Lake Victoria in the early 1880s; these falls are shaped by the waters of the Ewaso Narok River and plunge over 72m into a rift, spraying the dark forest below. 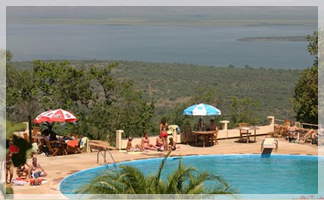 In the spectacular Lake Bogoria; hot springs and geysers are the main attractions. The lake has been called ‘the new home of the flamingo’ with a nomad population of up to two million birds. For the bird enthusiasts, Kesubo swamp located north of the park is home to more than 200 species of birds. Lake Baringo is the most Northerly of Kenya’s small Rift Valley lakes; creased with papyrus and well developed acacia forest. Hippos, crocodiles and monitor lizards are effortlessly seen from the shore, as is a magnificent display of water birds. This is Kenya's bird watching centre with over 1200 different species native to the country and more than 450 sighted here. A bird watcher's haven but beware, this is malaria land so it is best to come prepared with plenty of mosquito repellent. We enjoy a morning boat ride in search of hippo, crocodile, and fish eagle. After a sumptuous lunch, we then proceed to Lake Nakuru and the Nakuru National Park for an afternoon game drive. The park covers 180 sq km and is home to warthogs, waterbuck, buffaloes, reedbucks, and the occasional leopard. White and black rhinos were introduced to the park some years ago and you will find white rhino at the southern end. The park has also retained its reputation as an ornithologists’ delight with more than 400 species of bird found here. We spend the night at Lake Nakuru lodge. After an early breakfast, we depart for Masai Mara National Reserve via the Great Rift Valley arriving in time for lunch at the lodge. We then proceed on an afternoon game drive returning to the lodge for a delicious sundowner, and dinner at the Sentrim lodge or Masai Mara Sopa Lodge. The Mara reserve is 1510 sq km of incredible wide-open landscapes and fertile riverine woodland and one glimpse is enough to explain its appeal; it is typical savannah, with a mass of amazing wildlife. Wherever you go in the Mara you will see a frequent amount of wildlife such as Masai giraffe, baboons, warthogs, bat eared foxes, grey jackals, spotted hyena, topis, impala, hartebeests, wildebeest. Elephants, buffaloes, zebras and hippos also exist in great numbers. It is also common to see lions either basking after a heavy meal, or surveying the plains for their next meal. Cheetahs and leopards are harder to spot but are still reasonably common. Full days spent exploring the park in search of the big 5.Early morning and late afternoon game drives are offered. Optional hot air balloon safari can be arranged at an extra cost of US$ 450. Dinner and overnight stay at Mara Sopa or sentrim lodge. After a final early morning game drive we depart for Nairobi arriving in the afternoon hours. This is a private tour. Maximum 4 pax. Pick up from your hotel at around 8.30am for Masaai Mara Game Reserve on the way you stop to view the landscape and great rift valley view point later with Picnic lunch enroute. You arrive masai mara early evening late afternoon and proceed for a game drive in search of black manned lions, elephants, leopards, cheetah, buffaloes and other plain game. Return to the lodge dinner and overnight. A full day spent game viewing a cross the rich, tree studded grassland and rolling hills. The famous mara is renowned for its great herds of plain game, black-maned lions, leopard and cheetah but also contains numerous elephant and virtually every type of wildlife to be found in Kenya. You have an option of visiting masai villages or going to see the animals.If you are lucky this is the time to see migration of the wild beast all meals and over night in the Mara sopa lodge. Pre-morning game drive and after late breakfast leave Masaai Mara for Nakuru National Park with Picnic lunch enroute arriving in the evening. Dinner and overnight at Lake Nakuru lodge. After breakfast proceed for a game drive to Lake Nakuru which is world reknowned for its masses of flamingoes and is often referred to as the "Pink Lake". Beside birds,it is possible to see small game, like Water Buck, Impala, Rhino and Buffalo in the gardens surrounding. After lunch depart to Naivasha hell gate arriving in the evening dinner and overnight at the Naivasha sopa lodge. After breakfast, proceed to Hells gate National park where you will have a chance to visit the Geothermal Power Plant in Ol Karia and the Hot Springs. This is the only park that allows transport by walking and cycling After proceed to Nairobi with picnic lunch and proceed to Amboseli National Park.If time permit proceed for a short game dinner and overnight at Kibo safari camp. Early morning game drive before breakfast if weather is good you have the chance to view Mt Kilimanjaro. After breakfast, proceeds for game drive to see the big elephants,zebras,girraffs before you break for lunch. Later after lunch another game drive dinner and the overnight at the Kibo safari camp. Pre -morning game drive then after breakfast with picnic lunch game drive en-route depart to Nairobi arriving in the evening drop off at your hotel.